Hello everyone! 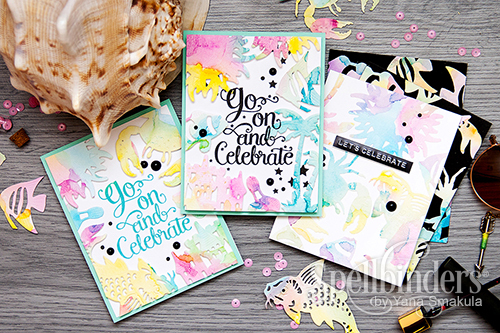 Last week I shared a couple of fun watercolor cards on Spellbinders blog using some of their new Inspire dies. Time to share them here as well! I used my favorite watercolor background technique to make these and I got so carried away that I made not one but 5 cards! Seriously, that is one addictive process! I started by creating a watercolor background – I simply added drops of spray ink onto a wet watercolor paper. I love this technique, its so simple and yet so effective! I mixed several different colors onto a full sheet of watercolor paper, dried it using my heat tool and die cut it using lots of different dies (all of the dies and spray ink colors are mentioned and linked below). If you’d like to see the entire creative process, please watch my video here or on Youtube. Its a rather long one, but I do share two ways of using those die cuts for two different looks. Like this video? Please give it a thumbs up and share! Thanks! If you prefer written instructions, please stop by the Spellbinders blog. Thanks! 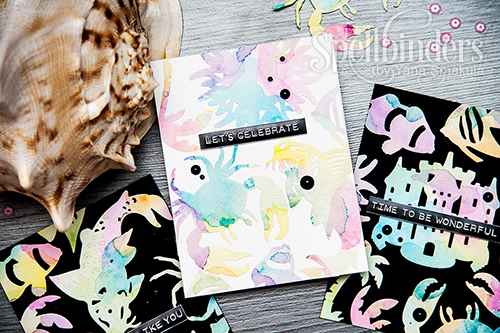 Links lead to Spellbinders, Simon Says Stamp and ClearSnap. At first I didn’t think I was going to like the technique but I always watch the videos as I have learned, first impressions can be deceiving! THIS, is a perfect example of that! The cards are awesome and the technique IS as well! This is why I like video tutorials best. When you can see the process you can appreciate the outcome! Thank you so much for sharing this Yana, it has proved to me, yet again, to take a second look. You might just be surprised! Love this technique. Your cards are beautiful.